And hey, if you like what I'm doing tell your friends! Give me a link, name drop me, plus 1 the posts on Google+ - it all helps. And if you REALLY like me, (doubtful), then follow me on Twitter @TiberiusTaylor or just click this LINK. Also, I started a Facebook group for those of us who aren't in to Twitter. Thanks to everyone who does read, it means a lot - here's a bonus image to get you all fired up, (or in today's case - the only image)! Ok, whoa, whoa, whoa. I can't continue until I learn more about this issue. 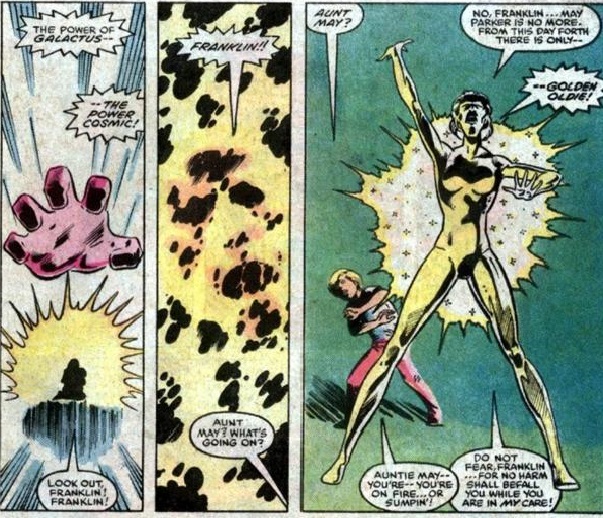 How does Aunt May and some punk from the neighborhood go up against Galactus!?!?! First off, this comic has not appreciated in value AT ALL. Near Mint fetches a whopping $2.00. One little fact that may have kept it from being a dollar for Mint is that it's written by Mike Carlin, (who went on to write for Iron Man, Avengers, Daredevil, Batman, JLA, Superman). This story was concocted as a tribute to Hostess who were doing full page ads at the time. The only cheap thing, (well, the whole story being an advertisement feels pretty cheap, too), is that it's all Spider-Man's dream but I guess that makes more sense then trying to actually explain how this would happen. Anywho, Aunt May and Franklin actually have to keep Galactus alive by rounding up all of the Twinkies in the world and letting him eat them. Yes, I'll give you a second to read that again. I don't know how much money Hostess was pumping to the Big Red in the 70's but it's crazy that this book actually came out. Two Ant-Man trades this week as trailers for the movie begin tickling out. While waiting to start Mad Max: Fury Road, (which is as good as the proverbial "they" say), I was surprised to hear Ant-Man referred to as Scott. 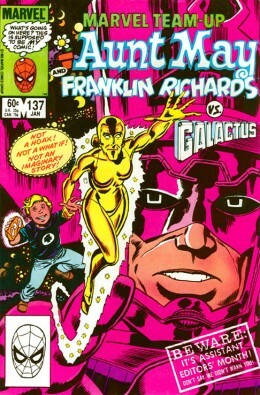 For some reason I just assumed they'd go with Hank Pym. Maybe I assumed that because I'm more familiar with Hank Pym. I wasn't even sure if there was a second Ant-Man until that trailer last weekend. 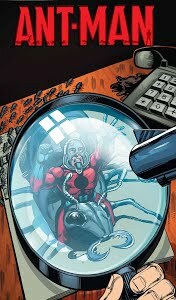 This book is more of a hodge podge then a stand alone story but if you're like me and weren't even sure if there was another Ant-Man or you're just curious about what might be in store next month this book is the place to start. 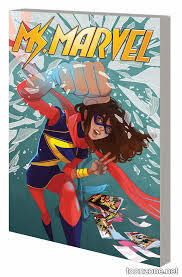 I've heard rumors that Angelina Jolie is asking around about directing a Ms. Marvel, (or was it Captain Marvel? 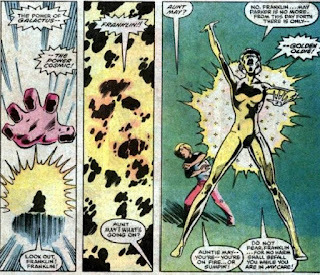 ), movie with Charlize Theron as the Marvel in question. Is there any validity to that, does anyone know? I'm going to go on record as saying I would watch that. It could be a smart move by the misogynist Marvel to reverse some of those growing opinions, (all though when the head of Marvel Movies says he doesn't think a woman could support a whole movie it's a little hard to ignore). Either way that's all speculation. This book isn't. It's the third volume to the series I covered here when the second volume came out.